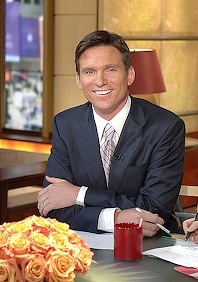 Good Morning America weekend anchor Bill Weir and country singer Martina McBride are part of ABC News' prime-time summer menu. TV news isn't what it used to be. But then you probably already knew that. Still, ABC News' just-announced roster of summertime fun fare might give pause even to Geraldo Rivera. All in all, it seems about as substantive as cotton candy washed down by a sno-cone. The featured attraction is i-CAUGHT, anchored by Good Morning America weekend guy Bill Weir. Premiering on Aug. 6th, the six-episode newsmagazine series aims to "dissect the avalanche of video images, now generated by cell phones, webcams, surveillance cams, downloads and uploads." ABC will have an i-CAUGHT website tie-in that encourages viewers to submit their own video for possible use on the program. Sounds like the network's America's Funniest Home Videos, except this time there'll be some sobering convenience store robberies caught on tape. Another six-part news series, Primetime: Family Secrets, precedes i-CAUGHT to the air on June 26th. This one "goes behind closed doors and sees first-hand the secrets most families would never talk about." Except that this is America, where just about everyone seems to want to be on the teevee. Scandals include a "real-life wild child" who was locked in an Austin, TX home for eight years and yet another up-close look at Hollywood's Baldwin brothers. "Black sheep" Daniel Baldwin provides a special treat by inviting ABC News inside his rehab program. There's also Six Degrees of Martina McBride, a July 30 news special that traipses after "six singers from the middle of nowhere with nothing but their dreams." Their objective is track down McBride in six steps or less to re-prove the old Kevin Bacon theory that we're all connected in some way to a chain of a half-dozen humanoids. Eventually one of the six gets a record deal. Remember now, this is from ABC News. And oh yeah, Elvis Presley is exhumed again, too, in the two-hour high-def TV event Elvis: Viva Las Vegas. Coming Sept. 12th, it depicts how The King re-invented Vegas while it simultaneously re-invented him. Current recording stars yet to be named chip in to sing some of Presley's Vegas classics, with the inevitable "never-before-seen" Elvis footage also folded in.